The Writing Bug: Roget...Yea or Nay? On the other hand, Stephen King writes: “Any word you have to hunt for in a thesaurus is the wrong word. There are no exceptions to this rule.” (Everything You Need to Know About Writing Successfully - in Ten Minutes). Likewise, Procrastinating Writer founder Jennifer Blanchard’s post on Daily Writing Tips offers a cautionary tale against thesaurus overuse. So, when is it okay to Roget? (Aren’t all the best nouns also verbs these days?) I think it should be examined on a case-by-case basis. A well-chosen word can make a sentence resonate. But there’s a fine line between eloquence and…excuse me for a moment while I consult the thesaurus…magniloquence (lofty and extravagant speech). When in doubt, read aloud. If your word choice sounds wrong (incorrect, indecorous, undue, unseemly, unfit, inappropriate, undesirable, inadvisable, impolitic, contraindicated, unworkable, incongruous, ill-suited, ill-considered, unsuitable, or malapropos), it probably is. Take it out and save it for Scrabble™. As much as I love the quest for a new word, I try to keep my thesaurus use in check. More and more often these days, however, I find I need one not to discover a new perfect word, but to help me identify the perfect word that’s just out of my brain’s reach—that frustrating ‘tip-of-the-tongue’ feeling. I wonder if Mr. King would approve of using the thesaurus as an aid for memory loss…? 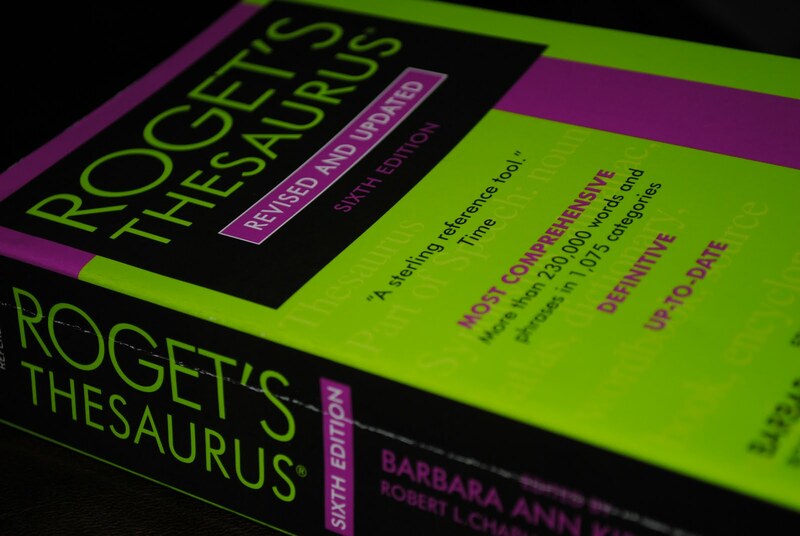 Do you have a thesaurus in your writer’s tool box? Do you use it? A use a thesaurus a fair amount when revising. I find it most useful in finding action verbs instead of passive or generic verbs. Like Kay, I tend to use a thesaurus during revisions, but for me it's usually to jog my brain after I discover I'm once again guilty of excessive word repetitions. I use a Thesaurus for the same reason you do, Jenny – to come up with the word I was trying to think of to begin with. I think it’s great your son gets excited over new words - sounds like he could be a budding writer. I do use a thesaurus occasionally--actually most of the time I just right click on the word in "word" and it gives me some other choices right there. Glad to hear that David is enjoying his new book. I used it a lot when I was an advertising copywriter. Not as much in fiction, but once in a while I still need to do some digging for a perfect word. That's where Roget's comes in. Or other online thesaurus links.